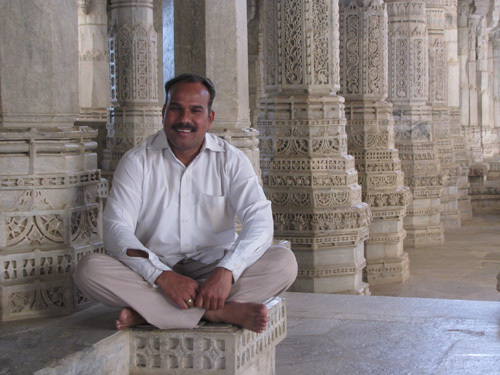 The second part of my trip will be spent in Udaipur visiting my friends Nirmal and Pushker and meeting their families. 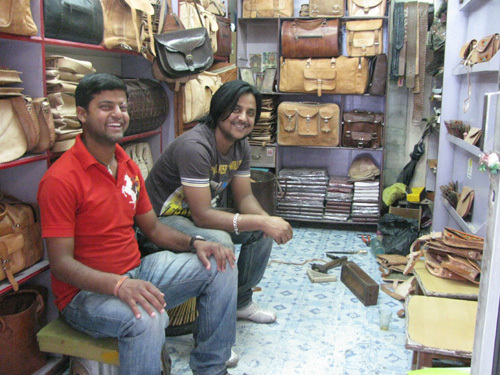 I met Nirmal when I wandered into his leather shop last year looking for a small purse. Pushker (red shirt) stopped by later. They’re friendly guys, so instead of buying the purse and leaving, I hung around. We talked and laughed for hours. Nirmal and Bharti just married! 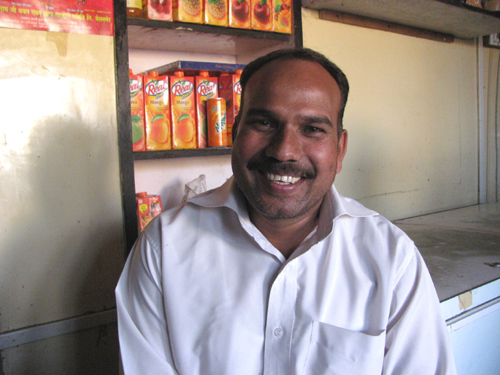 Nirmal was married last year. Unfortunately for me, the wedding was only a few months after I returned from India, so although I was invited, I was unable to attend. I’m eager to meet Bharti! Isn’t her wedding saree beautiful? 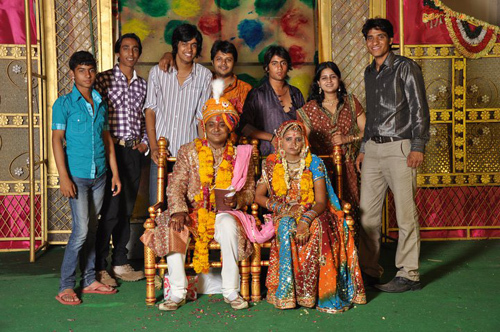 Cultural note: It’s traditional for an Indian bride to look sad at her wedding. She is to appear shy and modest. The sadness is because she’s leaving her family. 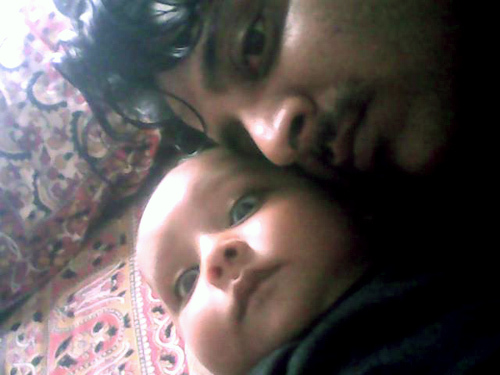 Nirmal and Bharti’s son arrived in May 2012. I’ll make his acquaintance this time. Pushker lives at the family home with his parents, three older brothers and their wives. They must have an enormous house! It’ll be so nice to meet his mother so I can tell her what a nice son she has raised. After spending only a short time with me last year, Pushker “adopted” me as his second mom and presented me with a going away gift of a small wooden Ganesha. He asked me to put it in my house where I would see it every day to remind me of him. It’s right next to my computer. 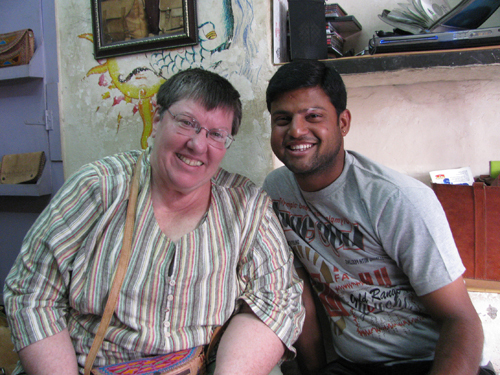 I feel lucky to have made friends with so many nice people on my first trip to India. This isn’t a normal occurrence for me when I travel. My contacts with locals are usually brief moments, as you’d expect. 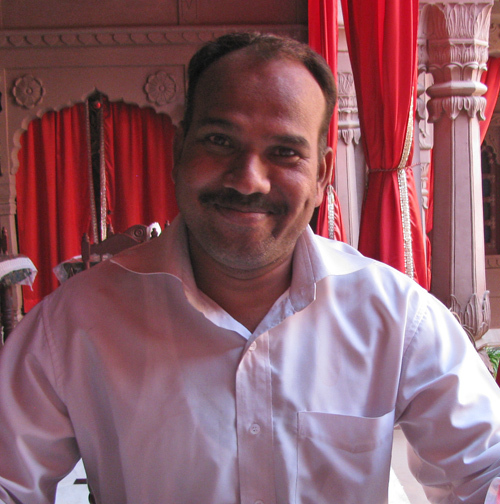 It says a lot about how friendly Indians are and explains why I got a ten-year visa this time. With such wonderful people and so much to see and do, how could I not? I travel solo and prefer it that way. Although there are many advantages to that, there are certain instances in which it would be nice to have a travel companion. I don’t sleep well on a bus. There have been solo women travelers who have done so and woken up to find someone else’s hand in their pants. I’d be nervous about oversleeping and missing my stop. And I have to keep my wits about me to avoid having my bag rifled through or stolen when I’m sleeping. I’m not freaked out about any of this; it’s just that constant watchfulness when going from point A to point B is not relaxing. Getting to New Delhi from Washington will take over 24 hours. 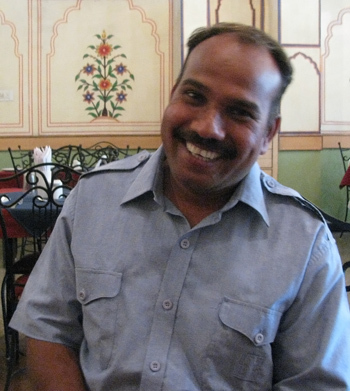 When I arrive at Indira Gandhi International Airport next month, my friend Prem will be waiting for me. I’ll be dog tired, but we’re leaving immediately for Shimla in a taxi instead of wasting time waiting for the next bus. I’ll be able to relax and sleep in the taxi because Prem will be there. Prem will say something to the driver if he’s not driving safely. He’ll ensure we won’t be overcharged. Prem will be there. There will be no problems. Prem is eager to show me the culture of his home village. I’m looking forward to meeting his wife, children and neighbors. He wants me to get a salwar kameez made and no doubt will have a tailor in mind. He wants me to see an Indian wedding. He wants to take me to temples and monuments in the Mandi District. He’ll keep me busy. I won’t need to plan anything, figure out what to see and do or think about anything. I’ll just go with the flow. Prem is a guy who knows how to take care of business. Nothing went wrong on our tour last year. If I needed or wanted anything, he took care of it. He is extremely capable and supremely trustworthy. I travel solo, so I’m used to being in charge of everything all the time. But I’m looking forward to Prem being in charge this time.